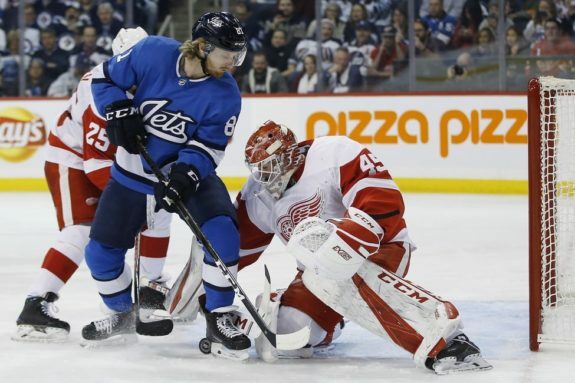 WINNIPEG — Kyle Connor scored once and added a pair of assists as the Winnipeg Jets defeated the Detroit Red Wings 4-2 on Friday. Jets veteran forward Bryan Little recorded his 500th career point with the game-winning goal. Brandon Tanev and Blake Wheeler also had goals for Winnipeg, while Wheeler added one assist. Laurent Brossoit made his 10th start of the season and stopped 33 shots for the Jets (28-14-2). Forward Luke Glendening had a shorthanded goal and defenceman Dennis Cholowski scored on the power play for Detroit, which lost its third straight game. Jonathan Bernier made 23 saves for the Red Wings (16-23-7), who are 1-7-2 in their last 10 games. Winnipeg scored early and late in the first period to mount a 2-0 lead. Tanev notched his 10th goal of the season 13 seconds into the first frame and Wheeler had his pass attempt redirected into the net off the stick of Wings veteran Thomas Vanek with two seconds left. Little made it 3-0 at 4:41 of the second with his ninth goal of the season — and 209th of his career — when his shot changed direction after hitting Detroit defenceman Mike Green, who was back after a 13-game absence with a foot injury. Little, Tanev, Connor and Mark Scheifele, who assisted on Wheeler’s goal, all extended their point streaks to four games. Scheifele and Connor each have six points in that span, Little five points and Tanev four. The Wings got on the scoreboard at 10:03 of the second after Glendening and Filip Hronek went in on Brossoit by themselves. Hronek faked a shot at Brossoit and sent the puck to Glendening, who beat the netminder on the stick side. Brossoit made a key save late in the second, smothering his glove over a puck that was behind him and heading toward the goal line. Cholowski made it 3-2 at 6:50 of the third when Niklas Kronwall blasted a pass to him and Brossoit couldn’t slide back in time to stop Cholowski’s shot. The Wings went on the power play with eight minutes remaining, but some blocked shots helped Brossoit and he also made some timely saves to kill off a delay-of-game penalty to Jacob Trouba. Connor scored into an empty net with 1:00 remaining. Detroit plays in Minnesota on Saturday and Winnipeg hosts Anaheim on Sunday.